Born at Stagira in northern Greece, Aristotle was the most notable product of the educational program devised by Plato; he spent twenty years of his life studying at the Academy. 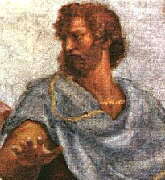 When Plato died, Aristotle returned to his native Macedonia, where he is supposed to have participated in the education of Philip's son, Alexander (the Great). He came back to Athens with Alexander's approval in 335 and established his own school at the Lyceum, spending most of the rest of his life engaged there in research, teaching, and writing. His students acquired the name "peripatetics" from the master's habit of strolling about as he taught. Although the surviving works of Aristotle probably represent only a fragment of the whole, they include his investigations of an amazing range of subjects, from logic, philosophy, and ethics to physics, biology, psychology, politics, and rhetoric. 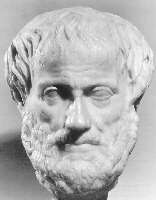 Aristotle appears to have thought through his views as he wrote, returning to significant issues at different stages of his own development. The result is less a consistent system of thought than a complex record of Aristotle's thinking about many significant issues. In Μεταφυσικη ( Metaphysics ) Aristotle tried to justify the entire enterprise by grounding it all in an abstract study of being qua being. Although Aristotle rejected the Platonic theory of forms, he defended his own vision of ultimate reality, including the eternal existence of substance. On The Soul uses the notion of a hylomorphic composite to provide a detailed account of the functions exhibited by living thingsvegetable, animal, and humanand explains the use of sensation and reason to achieve genuine knowledge. That Aristotle was interested in more than a strictly scientific exploration of human nature is evident from the discussion of literary art (particularly tragedy) in Περι Ποιητικης ( Poetics ) and the methods of persuasion in the Ρητορειας (Rhetoric). Aristotle made several efforts to explain how moral conduct contributes to the good life for human agents, including the Εθικη Ευδαιμονης ( Eudemian Ethics ) and the Magna Moralia , but the most complete surviving statement of his views on morality occurs in the Εθικη Νικομαχοι ( Nicomachean Ethics ). There he considered the natural desire to achieve happiness, described the operation of human volition and moral deliberation, developed a theory of each virtue as the mean between vicious extremes, discussed the value of three kinds of friendship, and defended his conception of an ideal life of intellectual pursuit. But on Aristotle's view, the lives of individual human beings are invariably linked together in a social context. In the Περι Πολις ( Politics ) he speculated about the origins of the state, described and assessed the relative merits of various types of government, and listed the obligations of the individual citizen. He may also have been the author of a model Πολιτειας Αθηναων ( Constitution of Athens ), in which the abstract notion of constitutional government is applied to the concrete life of a particular society. William Turner's full treatment in The Catholic Encyclopedia. Aristotle's rhetoric by Christof Rapp. Aristotle's logic by Robin Smith. the categories by Paul Studtmann. Aristotle and mathematics by Henry Mendell. Aristotle's biology by James Lennox. Aristotle's natural philosophy by Istvan Bodnar. Aristotle's metaphysics by S. Marc Cohen. Aristotle's psychology by Christopher Shields. Aristotle's ethics by Richard Kraut. Aristotle's political theory by Fred D. Miller, Jr.
the excellent treatment of virtue ethics from Lawrence Hinman. Eric Weisstein's entry in World of Scientific Biography. Aristotle and the morally excellent brain, from David DeMoss. A paper on Aristotle's treatment of homosexuality by Guy Bouchard. an article by D. K. House on whether Aristotle understood Plato. an account of Aristotle's contribution to mathematics from Mathematical MacTutor.